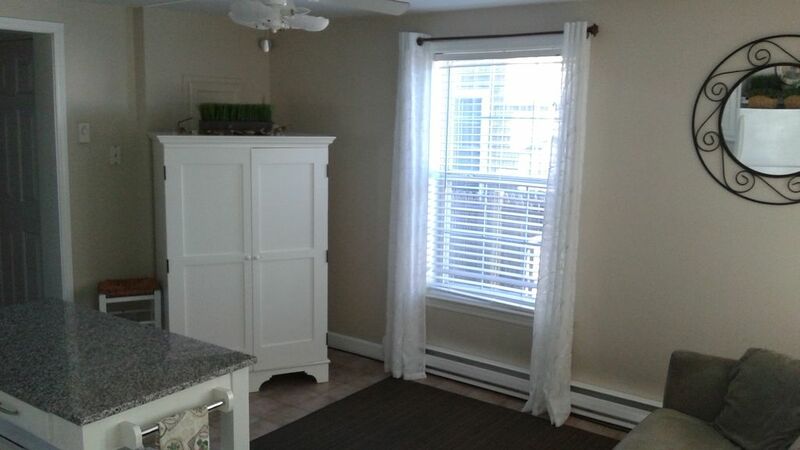 Wonderful single bedroom end unit one block from picturesque Wells Beach. Seal Harbor is located just off Atlantic Ave and Mile Road. It features an on premise outdoor pool and is a short walk (10 min) to food, shopping and an arcade for the kids. The condo is also a quick ride in the car or using the local trolley system to explore the local area including all Kennebunkport and Ogunquit have to offer. Parking is very tight there is 1 reserved spot per unit and unfortunately there are no guest spots. For showering only. Please bring your own beach towels. Unit is fully furnished and includes dishwasher and microwave full size refrigerator and stove. Queen size bed in bedroom and sleep sofa in living room. Unit offers a TV and DVD Player in both living room and bedroom. Free wireless internet is available. A/C in the bedroom for those rare nights that the ocean breeze isn't quite cool enough. Large inground pool and picnic area. Linens & towels are in the unit just bring your beach towels and enjoy. Perfect Perfect Perfect!!!! My teenaged son and I wanted a father son fishing getaway and we found it. This condo was perfect. Close to everything. Close to fishing charters, restaurants, grocery store and of course the beach. When the owner says it's 40 yds. to the beach he is right on the mark. It is an easy straight walk to the beach. A short walk to the Beachcomber for coffee in the morning. Everything in the description is spot on. The unit was clean, well kept and comfortable, great pool and very quiet. I contacted the owner several times during our trip. He was friendly, helpful and very courteous. My son and I spent the entire week fishing and what a blast we had. We made several trips to Mikes Clam shack for dinners and lunch, Ogunquit which is 15 min. down the road. We went to Kennebunkport (which is 15 minutes away) to catch a fishing charter then after we had lunch in town and did a little shopping. We ran up to Cabelas which is 30 minutes north on Route 95. I would highly recommend this property. You will NOT be disappointed. I have already booked this property for next year. All in all I can not say enough GOOD things about this property. You have to experience them for yourself. We have been vacationing in Wells for the last 12 years but it was the first time that we rented this condo. I wish we had discovered it a lot sooner! What a beautiful condo and so close to the beach. The unit is very clean, comfortable and nicely decorated (just like the pictures). It has a separate bedroom, quite a large bathroom and a fully equipped kitchen. The first floor location makes it so practical for loading/unloading the car as well as bringing in the groceries. There are so many things to do in this area but it is also great to just spend a full day of walking/playing on the beach (which is just across the street) and then relaxing by the pool. Needless to say, we are very anxious to go back again soon. Wells Beach is one of my favorite places to go for vacation. For the past 14 years we have been either at Wells or York Beach for a week each summer. This was the first time staying at this resort and it was just great. Everything about staying here was easy. The resort was easy to find. Jon made getting the key and paying for the resort easy. The condo unit was clean and had everything we needed for our week stay. All we had to bring was our clothing. It was close to the ocean which is why I go to Wells but also close to area attractions. We walked the Marginal Way, visited the Rachel Carson Wildlife Refuge, dined at the Steakhouse and the Maine Diner. The condo unit had a well equiped kitchen that allowed us to eat meals in as well. I would definitely recommend this condo unit. I am hoping to come back next year! Great vacation seconds from the sea! My boyfriend & I stayed at Seal Harbor for 7 days Aug 25th-Sep 1st 2012. We lucked out with excellent weather!! The property was very clean & well maintained, with updated furniture, & appliances! The kitchen island was my favorite part, made cooking easy and fun, great lay out! The beach was literally a 45 second walk across the street, with white powder sand & a beautiful stretch of Wells Beach, perfect for morning jogs or evening walks. The bonus was the Seal Harbor property had a pool, that was also well maintained, with a table, chairs, and sun bathing chairs. The property had an excellent sound barrier, as I didn't hear the neighbors once throughout the trip. The location was perfect because it was a short drive into the town of Wells, where we did groceries at Hannaford & local fish markets, 20 minutes to Kennebunkport & about 15-20 mins to the Kittery Outlets. If you wanted to stay local, there were plenty of gift shops, excellent restaurants, & even an arcade for kids & adults! The owner Jon, provided excellent communication & was generally a very nice person to communicate with via email & telephone. I would definitely recommend this property to friends & family, & we hope to return next year! Perfect Location just 20 minutes down to Ogunquit or up to Kennebunk, take a ride or hop the trolly. A Quick trip from Boston and you can have the sandy beach just steps from the door! Top rated restaurants (several within walking distance) shopping, anitquing, fishing, golfing, biking or hiking around the Rachel Carson Wildlife Reserve. There's something for everyone, even a car museum just a few minutes down the road!